Share Andy Nulman's amazing manifesto and enter to win a signed copy of Pow! Right Between the Eyes! | Andy Sernovitz | Damn, I Wish I'd Thought of That! Next up in our Word of Mouth Book Club series is Andy Nulman’s Pow! Right Between the Eyes: Profiting from the Power of Surprise. 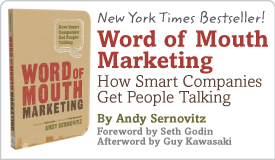 Andy is a brilliant marketer, entrepreneur, and sole owner of the title, “Prince of Pow!” His book is an eye-opening look at the power and potential of surprise marketing. We’re sharing an amazing manifesto Andy wrote based on his book, and we’ve got 10 autographed copies to give away.